The publisher of the Saint Paul Almanac invites novice and professional writers alike to participate in the 2011 version of this local treasure. Anyone with a unique Saint Paul story to tell is encouraged to submit their work for consideration in the 2011 Saint Paul Almanac, the publication’s fifth edition. The annually published Saint Paul Almanac features essays, poems, photos, maps, and listings of events, bars, restaurant, theaters, and other cultural venues within a datebook format. Writers featured in past editions include literary giants, everyday residents, students of all ages, journalists, new Americans, and lovers of Saint Paul who live in other corners of the world. Each submission is read carefully by the Almanac’s community editors who select the 100+ pieces to be included in the new edition. Each writer whose work is accepted receives a stipend. The Almanac encourages writers to make their story personal and specific, have fun with the process, and think outside the box in terms of topics and format. Most selections in the Almanac are 650 words or fewer, with a small number being as long as 1,500 words. Tiny poems are encouraged. 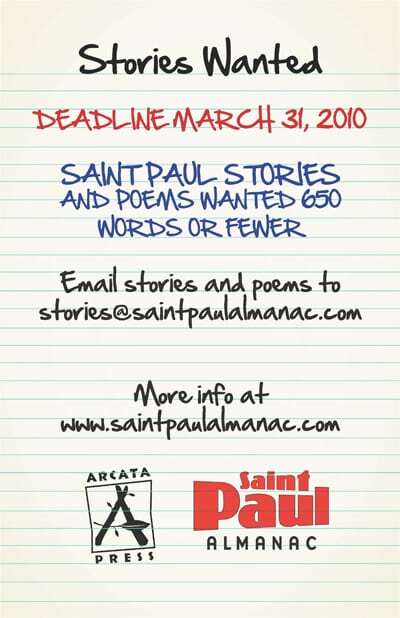 Writers interested in having their work considered for the 2011 Saint Paul Almanac have until March 31, 2010 to submit. Multiple submissions are acceptable. The complete guidelines for submitting a piece and ideas for topics are available at www.saintpaulalmanac.org on the Submissions page. Send your stories by email to stories@saintpaulalmanac.org. The 2010 Saint Paul Almanac sells for $11.95 (including shipping) online at www.saintpaulalmanac.org, and is available in independent and mainstream bookstores, including Barnes & Noble, Borders, and Amazon.com.